Supermodel and UN Goodwill ambassador for the Environment Gisele Bündchen narrates the latest film from the World Heritage Marine Programme, which premiered at the World Parks Congress in Sydney, Australia, to a standing-room-only crowd. Ms Bündchen is a strong supporter of ocean conservation and believes in its critical role in human and ecosystem health. She has given her time and talent to the project to share her passion and invite people around the world to celebrate and support the conservation of marine sites on UNESCO’s World Heritage List. In the 4-minute film, Ms. Bündchen tells the story of major conservation achievements over the last decade in three World Heritage marine sites–Aldabra Atoll in the Seychelles, iSimangaliso Wetland Park in South Africa and Glacier Bay in Canada/USA. At the end of the film, Ms. Bündchen invites the international community to join her in championing Marine World Heritage and to work together to ensure the protection of marine sites on UNESCO’s World Heritage List. Despite the successes highlighted in the film, still a third of all marine World Heritage sites have unsustainable fisheries practices and face many challenges inherent to multi-use marine areas. Coastal development, maritime pollution and climate change all substantially increase the threats these critical sites are facing. The film premiered on November 14 at the Ocean+ Pavilion at the 6th World Parks Congress, which drew more than 5,000 delegates who work at parks around the world to share experiences, discuss challenges and chart the path forward for parks as critical components in our global conservation solutions agenda. 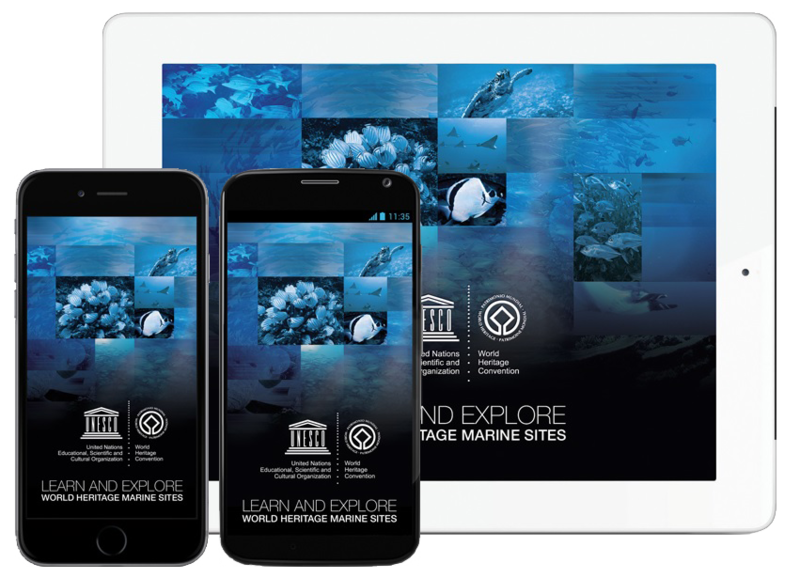 To continue to address these challenges, the World Heritage Marine Programme unveiled new smart phone apps that share all data, reports and decisions related to the conservation of World Heritage marine sites. These apps are an important resource for site managers and partners working at the 47 marine sites inscribed on the World Heritage List. With the apps, the regular site managers’ network meetings and the online site managers’ platform, the World Heritage Marine Programme provides vital ongoing support to teams on the ground at the 47 coastal and marine World Heritage sites, which include some of the most iconic ocean sites on our planet. Together, these sites cover almost a quarter of all marine protected areas in the world by surface area. Inscription on the World Heritage List brings global attention to these biologically important places and brings the power of the World Heritage Convention to the protection and stewardship to these sites. The World Heritage Committee created the World Heritage Marine Programme in 2005. The idea for the programme emerged at the previous World Park Congress, held in Durban, South Africa, in 2003.